The concessionaires are ready, the food is hot, and taste buds are tingling. 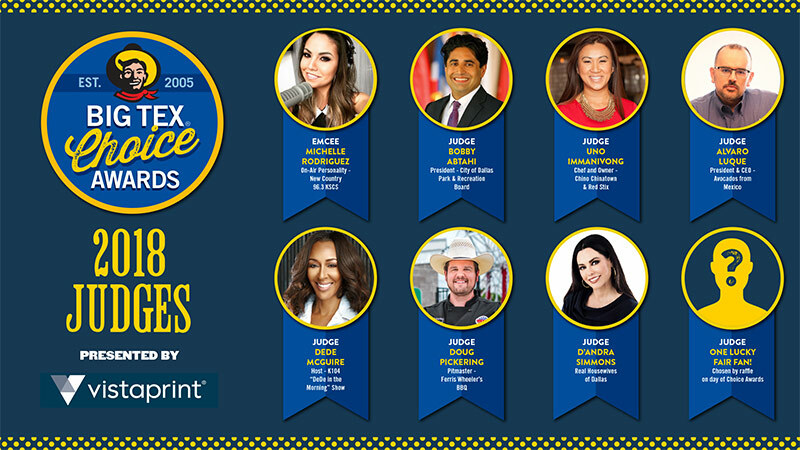 The wait is almost over – the 14th Annual Big Tex® Choice Awards is just days away, and it’s time to meet the lucky few who will crown the ultimate winners of this year’s Fair food competition. With 49 entries in the first round, the list of contenders was then narrowed down to 31 semi-finalists. From those 31 standout foods, 10 finalists were chosen to compete in the big event. 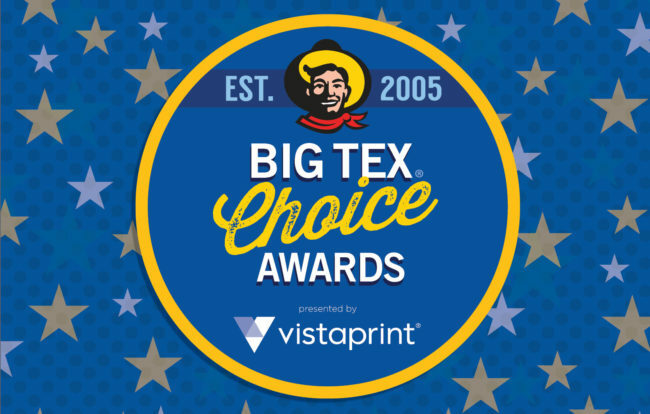 The members of the Big Tex Choice Awards judging panel will soon be faced with the trying task of evaluating this year’s food finalists and awarding the coveted titles of “Best Taste – Sweet,” “Best Taste – Savory,” and “Most Creative.” The 2018 Big Tex Choice Awards will host a master of ceremonies, along with a panel of six prestigious judges featuring a variety of personalities ranging from renowned chefs to local celebrities. IN ADDITION, ONE LUCKY GUEST WILL BE DRAWN AT RANDOM FROM THE AUDIENCE ON THE DAY OF THE EVENT. Robert “Bobby” Abtahi is a Dallas lawyer that represents clients in a variety of matters with an emphasis on serving as outside counsel for small to mid-size businesses throughout Texas. In addition to running his law firm, Mr. Abtahi serves as the President of the Dallas Park & Recreation Board. He was appointed in early 2017 by Mayor Mike Rawlings, becoming the youngest person to serve as Park Board President. Mr. Abtahi started in 2008 as an Assistant City Attorney and Community Prosecutor. In 2012, he was awarded the President’s Volunteer Service award by the Obama White House for his work in South Dallas. He has served as Chairman of the Friends of Fair Park, on the board of the Trinity Commons Foundation, the 2017 Dallas Bond Campaign Committee, and is a challenge coin recipient from the Texas National Guard. He earned his bachelor’s degree in Economics from the University of Texas at Austin and his J.D. from Southern Methodist University Dedman School of Law. He and his wife Tiffany are both Dallas natives. They have one daughter and spend their free time traveling as much as possible. Uno Immanivong has a 16-year career in financial services working for Fortune 100 and 500 institutions, including Citibank and Wells Fargo. In 2013, Uno left banking to pursue her passion for cooking. The kitchen is where Uno spent most of her childhood, learning and understanding Southeastern Asia ingredients while cooking with her mom. Today, Uno is the Chef and Owner of the hugely popular, Chino Chinatown in Trinity Groves and Red Stix in Legacy Hall. The menus at her restaurants are a result of Chef Uno’s passion for cooking and her Latin twist on classic Asian dishes. In less than four years, Alvaro Luque has turned the produce industry on its head. Alvaro is responsible for making Avocados From Mexico the first fresh brand to ever advertise in the Super Bowl, successfully achieving the number one spot for its digital campaign in 2018 among major brands advertising in this event. Prior to AFM, Alvaro spent 15 years holding marketing leadership positions in multiple countries throughout the United States and Latin America with Gruma’s Maseca and Mission brands. Among some of his most important achievements are the development and launch of more than 60 new products for Mission in seven different countries, and the development of the Super Soft tortillas in the United States, which has become one of the most successful launches in the history of the company. As a native of Costa Rica, Alvaro holds a Marketing degree from the University of Costa Rica and Advanced Management Program from Instituto Centroamericano de Administración de Empresas. After co-hosting the nationally syndicated radio program “The Doug Banks Show,” DeDe now hosts her own nationally syndicated radio show, “DeDe in the Morning,” heard weekday mornings on KKDA/K104 FM Dallas, Texas. DeDe has appeared on CNN, FOX, Oxygen, and BET and has interviewed world leaders from President Obama to Hillary Clinton, to celebrities such as Jay-Z and Beyonce. She has been recognized within her industry and community. Some of her accolades include the International Black Broadcasters (IBBA) Lifetime Achievement Award; winner of The Elite News Communications Award; Shades of Success Honoree; and named one of the Top 25 Women in Dallas by Rolling out Magazine. DeDe continues to give back to the community through countless nonprofit organizations and scholarships such as the Women Called Moses, Beauty and Brains’ DeDe McGuire Scholarship, and as the Community Ambassador for Dress for Success Dallas. In March 2018, she inaugurated DeDe’s Women’s History Month Kickoff Luncheon benefiting Girls Inc. Dallas and Dress for Success Dallas. Dede enjoys spending time with her husband Chris Allen and their dog. Five years ago, Doug Pickering left behind the world of Wall Street to pursue his passion for Texas barbecue. Since that time, the BBQ Pitmaster has become a serious player in the Texas BBQ scene, racking up honors including “Best Chef in Dallas,” “Best New Restaurant in Dallas,” and one of the “Top 10 New BBQ Restaurants in Texas.” After an 11-year stint as Head Trader for a Dallas-based Hedge Fund, Pickering left to start D.W.P. BBQ, a catering and BBQ school in Dallas. He became well-known for teaching locals how to sharpen their grill skills with full tutorials on the art of great BBQ. He then served as Head Pitmaster for Work Bar and Grill in Deep Ellum and then Head Pitmaster and Catering Manager for NL Group where he managed large-scale catering programs for Dallas-area hotels. Pickering graduated from Southern Methodist University with a Bachelor of Arts in Financial Economics and a Minor in Spanish. When he isn’t working the Pit, he and his wife, Amanda, enjoy fishing and listening to country music. A pioneering businesswoman and skincare expert who has spent more than 20 years in the nutritional and beauty industry, D’Andra Simmons is the founder and CEO of the skin care line Hard Night Good Morning. She is also the CEO and owner of Ultimate Living International Inc. In addition, she stars in the hit Bravo series, The Real Housewives of Dallas. A former Presidential Political Appointee at the Department of Energy in Washington D.C., D’Andra is an in-demand public speaker. D’Andra is an avid philanthropist who supports many charitable organizations. Her contributions include raising money for UNICEF (where she sits on the Great Plains Regional Board), the Salvation Army, and the Friends of Simmons Cancer Center. D’Andra is an International Ambassador for Mercury One and The Nazarene Fund, which has taken her to Iraq and Lebanon to visit with victims freed from ISIS captivity and persecuted minorities. D’Andra holds a bachelor’s degree in international affairs from Sweet Briar College in Virginia and was honored as a distinguished alumna in 2006. The finalists for the Best Taste – Savory Category, is Deep Fried Shepherd’s Pie, Deep Fried Skillet Potato Melt in a Boat, Fernie’s Hoppin John Cake with Jackpot Sauce, Texas Twang-kie, and Texas Fried Hill Country. The finalists for the Best Taste – Sweet Category are Cotton Candy Taco, Fernie’s Orange You Glad We Fried It? !, State Fair Fun-L Cake Ice Cream, Arroz con Leche, and Sweet Bakin’ Bacon. The food fun begins when the doors open for the 14th Annual Big Tex Choice Awards, presented by Vistaprint. The event will be held this Sunday, August 26 at 2:00 pm in the historic Tower Building at Fair Park. Attendees get the chance to sample all the tasty concoctions and cheer on their favorites while they compete for the titles of “Best Taste – Sweet,” “Best Taste – Savory,” and “Most Creative.” Tickets to the event are now SOLD OUT. All proceeds from the event go to the State Fair of Texas Scholarship Program to help send youth to college throughout the Lone Star State.